This was my first summer having a garden and it coincided with the summer I hatched a new human and the themes of both keep blurring together: The goofy pride in growing things from seed. The occasionally overwhelming feeling that there are so many things and they’re all very hungry and counting on you to fix this. The twinge of sadness as they look less sprout-y and more robust. The urgency to not squander any of this. With that in mind, there’s the fact that a very warm fall has meant that instead of this garden looking near collapse, it’s going strong and the four billowing pots of herbs that remain are pressuring me to do something great with them before they meet their imminent frosty demise. Fried sage leaves on everything! Crisp rosemary flatbread all the time! Minced chives on every dish! Parsley… I mean, I like tabbouleh and all, but there’s no way I’m going to get through this. Let’s not pretend this made a huge dent, but 5 sprigs down is a respectable effort, right? Look, I know all of our cooking dance cards are full right now, beyond capacity, even. You’ve probably got your menus sorted. But this was too cute to save for a less frenetic week. Basically, I figured out that you could take any old biscuit and make it rather festive by egg-washing a flat parsley leaf on top before you bake it. I mean, that’s it, that’s all there is to it. The biscuit recipe I used is an old reliable; I’ve made it with cheddar and blue cheese both before. This time I used pecorino but parmesan is more likely what you have around right now and works, or certainly better than going back to any grocery store anywhere two days before Thanksgiving. I held back on the minced scallion I usually put it, but missed it. You could also use a little bit of onion or garlic powder for a more full flavor. You could also use whatever biscuit recipe you were going to, anyway and just do this to it because it turns out biscuits like to dress up for dinner parties too sometimes. 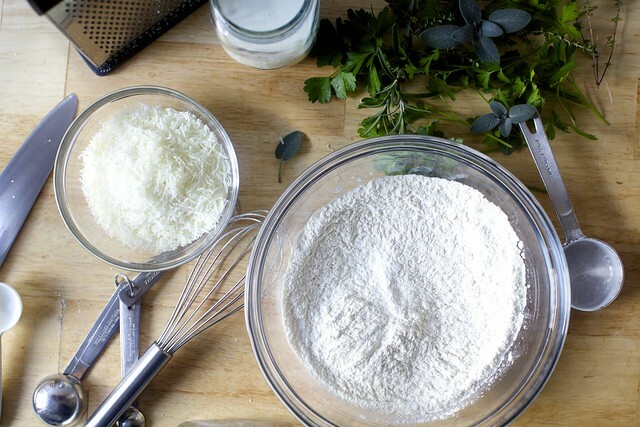 Heat oven to 425 degrees F. Stir together flour, baking powder, baking soda, and salt in the bottom of a large bowl, then use your fingertips or a pastry blender to work the butter into the dry mixture, until the largest chunks are the size of tiny peas. Stir in cheese, scallions and chopped parsley, then buttermilk, stirring just until combined. 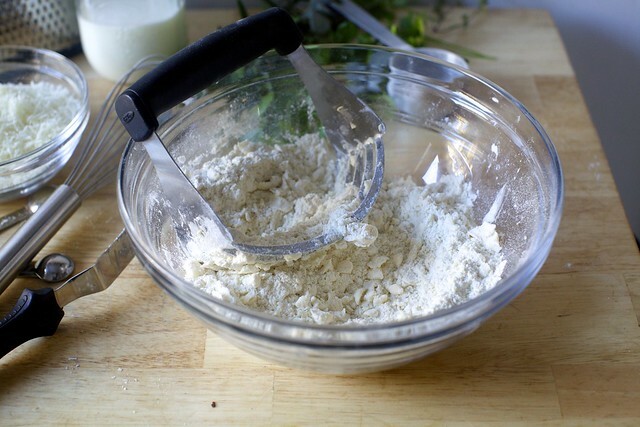 Knead once or twice right inside the bowl to form into a rough dough. Pat or roll it out to a 1/2-inch thickness on a floured counter. Cut into 2-inch rounds, pressing straight down and not twisting the cutter. Place on an parchment-lined baking sheet. Brush the tops of each with egg wash, then place one leaf at the center of each biscuit top. Use brush to dab leaf with egg wash.
Bake biscuits for 11 to 13 minutes, until golden brown. Eat right away, or at least before the day is out. Because biscuits are best on the first day, if planning ahead, I like to make the dough, cut in into rounds and freeze it until needed. 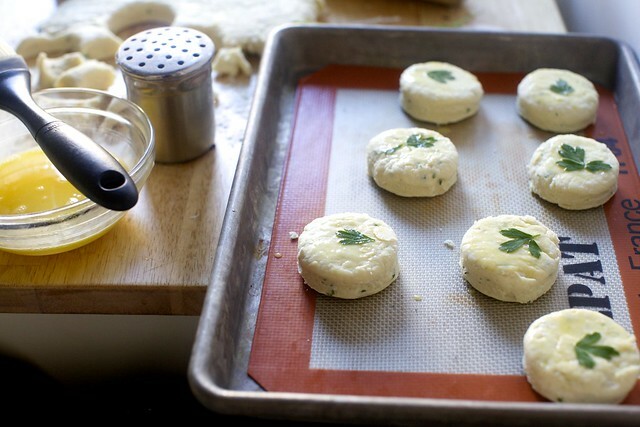 Biscuits can be baked right from the freezer and will only require about 2 minutes extra. Brush egg wash and leaf on right before baking. sounds like it’s time for a big batch of chimichurri! So cute! Looks like a St. Paddy’s Day treat! 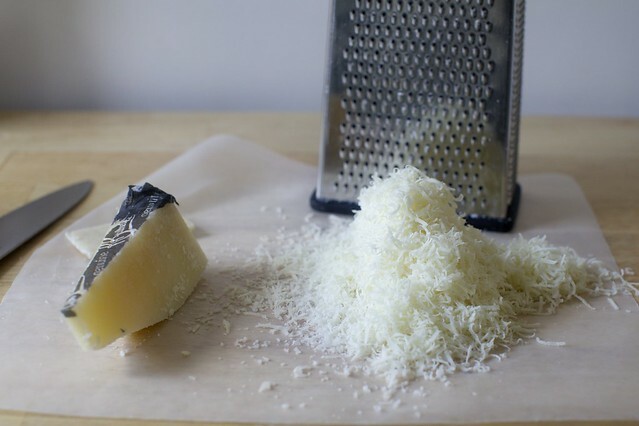 I will try this recipe, but why would you add extra salt to salty pecorino? I am hoping someday you can help me design a pecorino romano chocolate cake. So far, the Pecorino flavor doesn’t shine through, and any more than a fine grate of dark chocolate overwhelms completely. I was just wondering what to do with the pecorino in the fridge! For the parsley: chopped and smothered in oil (like, in an ice cube tray), it freezes and thaws well. Happy, Happy First Thanksgiving as a family of 4 – the photo of those two – too, too sweet. And the newsletter – VERY nice. I am loving it and finding new things to try. Your kids are so cute! and her hair!! :) I could never understand why people get so excited about my son’s red hair. But, then I see her red curls and I totally get it. And I will have to try this recipe, someday. I’ve tried the blue cheese things (forget the name?) from your cookbook, and they are wonderfully tasty. Thank you! Have a good holiday. My mouth is watering! I am such a sucker for biscuits! Sugar is mentioned in the directions but is not in the ingredient list. Eat both of those “turkeys” right up without delay.The tiny tender one will have a wonderful sense of humor, her brother is going to ensure that.Those blue eyes must seem a marvel to you. They are striking, and I have always commented on the wonder of Jacob’s dimples. Precious. Those biscuits are adorable. They look like they would be a festive addition to the Thanksgiving table. I have been layering my herbs with kosher salt and using them all winter on roast chicken, eggs, roast vegetables. Really anything. I have mostly Rosemary and Thyme, but I think any herb mixture would work. Happy Thanksgiving! And thank you for a wonderful site! These biscuits look amazing! I need them in my life asap! Your little herb garden sounds adorable ~ maybe you can winter indoors? My husband has had it up to the roof with all the pots I’ve made him bring inside though! But I don’t want to loose my rosemary. Happy Thanksgiving to you! This biscuits look ridiculous delicious. Lovely! I’ve found that parsley, finely chopped, freezes really well even without oil or anything else added to it. I just pulled some out of the freezer the other night to add to a soup that needed something fresh and green, and it fit the bill wonderfully. Parsley is often abundant in our garden. We chop large handfuls, shove them in a jar and salt generously. It lasts for weeks in the fridge. We just cut way back on the salt when we use it. It works great. The biscuits look so festive. I just made your butternut squash galette, but used a mix of Colby, jack and mozzarella, because that was what was in the fridge and it was so good. Used some wheat flour like it says in the cookbook and the crust is perfect. I am making a mashed potato casserole and sweet potato casserole from Cook’s for Thanksgiving because they are do ahead. You and Cook’s are the only trustworthy sites to go for recipes. Happy Thanksgiving! Amazing! This sounds like a great addition to the Thanksgiving table and also reminds me of St. Patrick’s day for some reason (my birthday!). 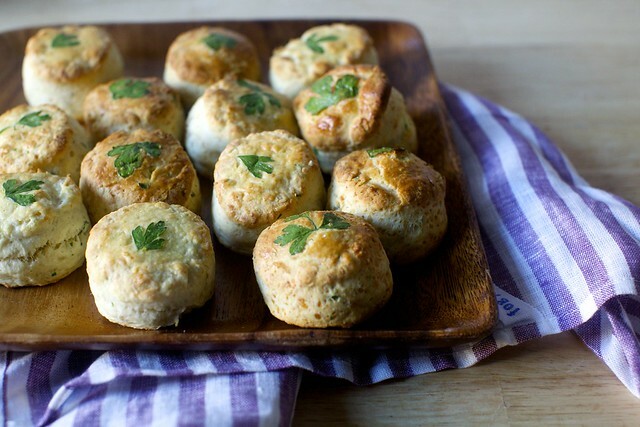 Anywho, biscuits are my love language and these sound perfectly flavorful and herby and buttery. I LOVE pecorino!!!!! The moment I get back home, I am so going to try this one! Do you have some suggestions regarding with what it´s better to eat them? The rosemary flatbread recipe is the main reason I grow rosemary. We love it soooo much. Re, placing the parsley leaves — I know it looks sooo fussy but I could not have been more hasty (I perhaps spent 22 extra seconds on placing the leaves) or half-ahem-ed with it and they still look cute. I actually had figured it wasn’t going to work so I didn’t put much effort in. It was a pleasant surprise! Sugar — Sorry, typo from an earlier draft. Now removed. No sugar! Katy — I use salt, but not as much as I would with a less salty cheese. Didn’t find it over the top, but you can of course omit it. Also annoying is that some aged pecorinos are saltier than others. Mine was fairly salty but not the most salty; you can always adjust to taste. Re, pecorino chocolate cake — did you ask me a while ago? Maybe I’ll start with a muffin in the new year. I admit I’m fascinated. Is this more of a “thing” in Italy? Laura — Sadly, the deck is big, the apartment is small, no room for the pots. Plus: bugs! I know, I’m such a baby but earlier this summer I thought it would be cute to bring the cilantro pot inside for a photo of the ingredients in a dish that used them and proceeded to spend the next hour on ant removal. These would be such an easy savoury snack! I love your cooking, but I love the pictures of that gorgeous little red-head even more. Thumbs up for the growing from seed. I have never wanted a biscuit more in my life than I do at this moment. Well played ;). Reading this at work which is a big mistake – I wanna go home and bake these cheesy little morsels right now! I have parsley in my garden too – it is such a fresh taste. These look incredible! A tip for using up parsley – Fine Cooking has a great cilantro pistachio pesto that I make with parsley and it’s wonderful. They do it in a pasta salad type dish with roasted cauliflower and carrots (delicious) but it’s pretty tasty any which way you decide to use it. These sound awesome. Katy, the salt is probably for the leavening not so much salty flavor. My guess is the buttermilk helps to balance all the flavored nicely. Can’t wait to try this. Remember that grilled feta madness with tomatoes and onion and not basil? It works well with canned tomatoes (Muir glen fire roasted, especially), in the oven, over polenta. We’ve been making it with parsley as the only herb and it is amazing. We love your recipes. You are my number one recommendation when someone asks where to find a recipe or an idea for this or that. Thanks for all the good stuff. excellent recipe! please, share the brand and photo of the cookier cutter? I am still looking for “the perfect one”!!! They look fabulous. I will try your recipe this week. Thanks! That looks so delicious, I love cooking with pecorino. Thanks for the recipe! I’ll take any excuse to use Pecorino. And I’m a biscuit fanatic. But I’m not a parsley fan. Any suggestions for alternatives? Nice recipe – will try it soon with the rest of my potted parsley. I have been leaving rosemary and sage plants in pots on my front deck every winter with great success. I wrap the pots in burlap sacks (bubble wrap would work too but doesnt look as pretty). I live in Germany and we get quite a bit of cold weather here. Maybe worth a try. I used to work for a caterer that would slice very thin slices of potato, sandwich a leaf of parsley or cilantro between two of them, and fry them into potato chips. They looked amazing! More fussy than these biscuits though. If you wrap the green tomatoes in newspaper, put them in a box and let them sit, some will ripen. My favorite way to save herbs especially parsley and basil at the end of the season is to clean, remove the woodiest stems, and roll the bunch into a tight log, wrap tightly and throw into the freezer. You can slice what you need off the end. Mine lasted into the spring last year-flavor fades a little but is still useful (imho). I just learned to freeze ginger too, to make grating it fast and very easy. All the herbs are in a plastic box on one shelf. Are u still working on that second cookbook. Roxane — It have these biscuit cutters. Can your baby (and your other one too!) BE any cuter?!!! When I have a plethora of parsley…and I always do…I rinse it, pat it dry, put it on a paper towel and zap it in the microwave for a minute or two…voila! great dried parsley. Happy Thanksgiving to you and your family! These biscuits would be so perfect for entertaining. I would serve them as an aperitif with wine, love the Pecorino in them! I made something similar some time ago with Parmesan and they were polished in less than 15 minutes! My parsley and rosemary overwinter just fine here, but I am in South Carolina that may have something to do with it too. That first paragraph is one of the best things I’ve read in a long time. – Rosemary infused bath (or body) oil – divine, esp. in the morning. Those parsley leaf potatoes went a long way to winning over my boyfriend’s mother at a dinner party, so I am extremely excited for the opportunity to pull that nifty trick out again, plus pecorino. In an alternate universe where I actually have a salvageable surplus of delicate herbs (they will wilt and die, either in the fridge or in the pot), I’d definitely put them towards… infused liquor. Parsley vodka, is that a thing? I willingly offer myself up as a guinea pig for that experiment. Those two kiddos are too gorgeous! Happy Morning After…made these yummy beauties and used them all broken up as the biscuits in my stuffing…thank you for this recipe, I will be using it again for sure. There are many comments about the pictures of your children, but I don’t see them. Can you tell me the secret? Really these biscuits looks great. Enjoy your tea time dear. These biscuits looks great. Remind me of Ridnaun. I like to use up fresh parsley by putting big bunches of it into sandwiches, like you would do with lettuce or baby spinach. One of my favorite sandwiches is roast beef and cheddar and parsley, on rye or sourdough. I think parsley would probably be pretty good on leftover turkey sandwiches too! My best usage of tons of parsley is Rachel Ray’s parsley pistachio pesto pasta. It is heavenly with lemon and cream. I’m drooling just thinking about it. And it is my secret marriage glue that and crispy fried onions. And speaking of the green bean casserole was a hit. I secretly added a layer of Gruyere beneath the crispy onions and bacon to the mushroom sauce. And the verdict from one at the table was ,”OoOo! I’ve never had green beans like this before.” YAY! Excellent! We made these last minute for our Thanksgiving feast, and made them as drop biscuits instead… fabulous!. thank you for sharing. I made these tonight and they were delicious! They were very easy to make and I love the look of the parsley leave on top. Thanks! The parsley decoration worked quite well on the white bean and leek galette. I’m usually pretty Plain Jane in my presentation, so there’s a trick for the books. Thanks for beatifying our Thanksgiving table! For your remaining parsley, may I recommend some chimichurri? Great with anything grilled or roasted, although steaks are a clear win for the carnivores. I know this is the wrong place to ask this question (I can’t find the right place), but I want to buy that mixing bowl/measuring bowl with spout that I see in some of your pictures (but, of course, I can’t find now). Can you help with brand? link? For Thanksgiving my 27 year old son made your Brussels sprouts and stuffing, wow. He introduced me to your site. Thanks! This looks yummy, as does Anna and the portion of Jacob’s adoring face. “Potatoes Anna” being one of my faves, any chance of a riff on those sometime? Seems appropriate. For those of you not raised with Kosher or “jewish” food, I can tell you there are lots of nifty things to try in the Kosher section of your supermarket. Kedem Grape Juice ( for anyone with kids, or for non-red wine drinkers) just for starters. I “married into” a sweet kugel family, and have found some great products as a result. My mom ( Episcopalian with German roots) always made potato pancakes with applesauce for Shrove Tuesday. I prefer the sour cream and chive treatment now; although I would not turn any version away. At holiday time the Kosher aisle can yield a lot of interesting items… it’s like a trip to a new country, worth exploring! marilyn — Is it like a big glass measuring cup or a blue wider bowl with spout edges? I think it is the blue one, but I’ll take both if not too difficult. I love your site. Am so glad Micheal introduced me to you. Things like that are what you have to look forward to in 25 years. These biscuits are just incredible. 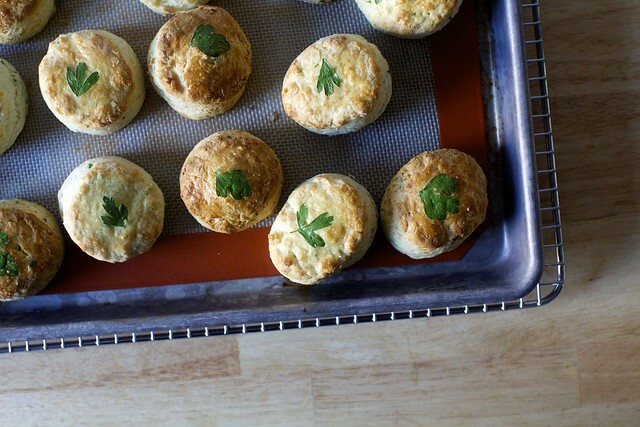 Light and flaky, and oh, that pungent pecorino cheese and the fresh burst of parsley in each bite… I made them for my family to accompany our Thanksgiving dinner and we loved them. Thanks for the great recipe!! Hi Deb – Do you have any “make ahead” recommendations for this recipe that won’t sacrifice freshness, etc.? Having friends over for dinner on a Friday and desperately want to make these, but won’t have time to on the day of or the day before. Do you think making two days prior would be okay? Or perhaps make the dough ahead of time and then pop them in to bake the day of? Any thoughts/suggestions you have are most appreciated! Thanks! Deb! What can you tell me about silpats? I’m a new baker, with a Kitchen Aid on the way, but I’ve only use prepared cake pans/cookie sheets or parchment paper. When are Silpats best? How do you care for them? Worth it?? Thanks! Hi Deb, I also run into a problem where my 1 cup of liquid is not enough to hold the dough together be it scones or biscuit. Do you have any suggestion? Thanks. Your parsley is probably used up/dead by the time I’m writing this, but every Pesach I make parsley new potatoes, and my husband loves them enough to request them all spring/summer. Super easy, and uses most of the parsley from the bunch I buy for the maror [this brings up that I have no idea how they section up those parsley bunches i.e. I have no idea how much they weigh/how much parsley is actually there…] — I usually use at least a full cup of very finely chopped parsley for two pounds of new red potatoes. I wish it was simple as egg-washing a flat parsley leaf on top before you bake it… it looks as though its a more detailed prospect that that…dont they look gorgeous!!!! Deb, I had to come in and comment on these dear, pretty little biscuits many months after you posted the recipe. I made them this past Easter to snack on before the main meal, along with Italian oven-roasted artichokes and your caesar salad devilled eggs (now an official part of our celebrations as they are so popular and easy). The biscuits were a huge hit with everyone–so sweet looking, perfect for Easter esthetically. They rose beautifully in the oven and tasted so delicious! Everyone stuffed the leftovers in their pockets to take home and there were even a few squabbles over fair distribution. They were so delicate that even the ones I re-rolled with the dough left after cutting out 16 were still tender. So I actually had closer to 2 dozen! Yum! Will definitely make them again. Thank you! Looking at your website day by day makes me wanna work harder T.T because I love these design~~~ I want to bring them home T.T Thank you for sharing. sooo many great design. As an Israeli, I’ve never tried biscuits before. While I visited the US ages ago, I wasn’t familiar with anything American. This is so unfortunate, because I made them today and they turned out super ultra delicious. Thank you for this great recipe. I did make some tweaks: used double the amount of parsley, used onions instead of scallions and used Indian-style spiced buttermilk, because that was what I had. I loved the extra punch, but it was also waterier than my usual buttermilk, and I suspect the dough may have been wetter than it is supposed to be, more like batter. Certainly, there was no way I could roll it out. So I just formed rough discs with my fingers and put them on the tray and it worked out fine. Next time, I’ll keep the extra parsley, use regular thicker buttermilk, and add the spice in seperately myself — Kashmiri chilli powder and cumin, I think. About the garden–I know it is a year later (but the East coast once again has been having warm weather). Why don’t you bring the perennial herbs inside? Rosemary, at least, almost never gets pests and is a wonderful herb to have around (and it can be decorated for Christmas and it makes wreaths). I also have thyme and Greek oregano, which can take a freeze or two before being brought in. Too precious and so easy to achieve! I can’t wait to try it next time I make biscuits – Happy Thanksgiving! I made this. They look like yours (miracle of miracles) but I don’t think they taste as good. I didn’t know how much parsley two tablespoons would be; I looked online and got some guidance, but I was unsure. I didn’t know how finely to chop the parsley or the scallions. I did everything as close to your description as I could. I used the dip and swipe for flour, every other ingredient was exactly as it appears in the recipe. Because I used scallions (two scallions seem to be a lot, was I meant to use most of the green and the white?) it added moisture and the dough was hard to work with. I minced the scallions, chopped the parsley and loosely filled two tablespoons with parsley. The biscuits are pretty and taste good but not great. It was a good bit of work, most of them are frozen for Thursday but I made three or four to try them. The person I served them to said they were good, but given the work I did he wouldn’t say otherwise. I had one and thought it was good but not great. I’m certain I did something wrong. The fact that I have to ask about the amount of parsley is a giveaway that I’m not an experienced cook. Could you provide a “beginners link” for basic concepts? It’s not fair to expect you to remember to say “remember, two tablespoons is this much” or similar in each recipe. 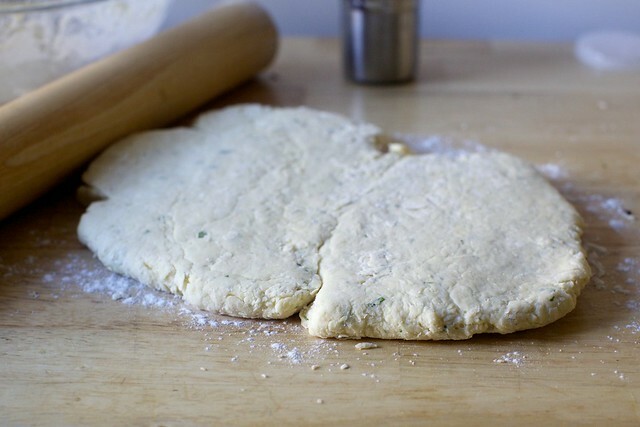 How do you avoid overworking the dough? I made the two inch rounds, but then had to form the dough again, and a third time – or I would have wasted a lot of dough. What do you do if the dough is too wet? I had to flour my hands a few times (the scallions?) how do I know how much “two slender scallions” is – I may have used too much. Unrelated – the leek and bean galettes, I bought five leeks because they seem large and one can of beans, it seems that I will have a lot of leek compared to the beans, but I’ve never cooked with leeks before. I eat healthily but the same things and it’s boring. Your blog has so many delicious things that are healthy and interesting. I wasn’t able to walk/stand for some years and now that I can I want to make up for lost time and cook well. Thank you for a wonderful resource full of good food and humor. Maybe its the 1st grader in me, but I love putting the parsley in the middle of that biscuit, it reminded me of ironing leaves in wax paper! Beyond that they tasted great, I added pepper and put in chives instead of scallion. I made these for Thanksgiving (ha, i’m such a procrastinator to only be commenting now! )–but they were so spectacular, we had leftover mashed potatoes cuz everyone got their carbs from these. I’m not usually a fussy kind of baker, but I was so glad I did the little parsley on top bit, as it dressed them up for the occasion. My brother ate 4, and it would’ve been more if we’d left the plate in front of him. Way to go, Deb! What a brilliant article this is really very great and awesome project. I just made this with 3/4 cup cheese, and it was so good! Soft and fluffy and a delight. They rose a lot less than in the pictures though. We are one of the best call girls agencies in Mumbai and recently we launched this website for our customers. Here you can take all type of escorts services. Kolkata maintenance services work only by those girls who make cards for our firm criteria. We believe your corporate later, therefore we offer those girls who will leave long-lasting work in any public act. I have tried to make biscuits a few times (I’m actually a southerner) and this is the first recipe that turned out perfectly for me the first time – my family raved! I swapped white cheddar for pecorino (about a cup) and used chives which seemed to work great. I want to try them with pecorino also!